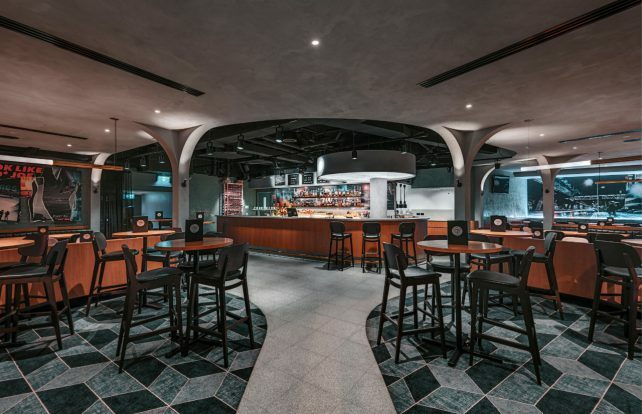 Leading designer to the pub trade, Paul Kelly explains in his own words why large-scale, multi-purpose pubs – with alcohol-free areas – will be the winning venues in 2019. This is our 21st year in business and it’s been a huge year of us planning systems and breaking new ground in a lot of the hotel markets, specifically with sports and a lot of food and beverage. One hotel is the Ambarvale Hotel in Campbelltown. We’ve just finished stage one – a massive gaming, entertainment and sports complex. Essentially we’ve developed the first sports theatrette concept specifically for non horse-racing events. It has its own bar, we’ve got a gaming room that’s spectacular, a huge big TAB complex adjacent, which has its own bar and balcony. It’s a very exciting large-scale format. Stage two opens in the first week of March, a 400-seat bistro/brewery concept with outdoor and kids areas. All the projects we’re doing at the moment, they’re all massive, 2,000sqm formats. The industry has seen what’s happened at the Gregory Hills Hotel and the success of that, and thought they’d have a crack at it. The management structure of these types of venues has been standardised and simplified so it’s easier for people to understand how it could work. It’s accelerating in 2019. We’re doing a lot of master-planning for big sites, much of it up in Queensland. But the biggest venue is happening in Western Sydney. Brisbane is getting quite active and a lot of NSW publicans are buying up in Brisbane at a development called Laguna North Lakes and the Gold Coast, specifically the Mermaid Hotel. 2019 is difficult to predict, however I’ve never seen more money being spent on hotels. The fitouts are becoming more and more elaborate, it’s getting back to where it was prior to the GFC. The scale of venues is increasing, the turnover of venues is increasing and the general public perception of these venues has altered significantly. Essentially it comes down to one key point – Australians are eating out more than they ever have. The US economy – which we follow – has this year spent more eating out than at home, that’s the first time that’s ever happened. The result is there are more venues, people are drinking less, but they’re eating more and wanting to spend more time at these venues. The venues we’re doing are becoming incredibly intelligent. We’re diversifying the markets we’re trying to attract. Some venues – The Beverly Hills Hotel in Sydney we’re trying to develop next year – we’re targeting a latenight food market. Developing sporting markets and creating areas for non-alcohol consumption because of the benefits to other sectors of the business of people not drinking is significant. We’re really screwing into how these places operate, and it’s because they’re so big that we need to attract pretty much everyone. Something we’re doing a lot of at the moment is in-house smart brew systems, for example at the Ambarvale Hotel. Big, large-format kitchens using open fire and charcoal are very current. But we run 20-30 projects at a time and no two projects look the same. But the cluttering of spaces and making them really ostentatious and eclectic is over. They’re becoming more ‘serious’ again. More streamlined and almost like mini casinos – they’re becoming a more serious offer now. Layout planning-wise we’re really getting different sections of markets into venues, say for example family markets, markets that are into morning coffee, trying to make sure that if we can get certain periods covered – the 5:30pm to 7pm market, there’s a really good market there. So not just the layout but the product is attractive to those markets. A lot of gaming markets don’t drink, and those that do drink put off the ‘real’ punters, so we’re creating areas that pull people away from the traditional notion of a pub and more of an entertainment complex.